On impulse, Cynthia Hicks shelled out big bucks at a Chinese pearl factory. When buyer's remorse kicked in, the emotional journey behind it was unexpected. When Jennifer Shanahan’s trip to Paris for a music-themed family getaway was silenced by a terrorist attack, a small group of street musicians served to momentarily dissipate the sadness, confusion, and fear surrounding the horrific event. Barbara Wysocki celebrates Catalonia's patron saint in Barcelona on a day that also recognizes a noble dragonslayer and marks the deaths of two literary lions. With a potpourri of bookish events, roaming musicians, and a chance to dance, she gets swept into the magic of past and present. Much as travelers may try not to make sweeping conclusions based on superficial observations, happiness is a common attribute applied to Cubans by foreign visitors to the island. In this reflective essay, writer and tango aficionado Maraya Loza Koxahn shares her experiences in Cuba and thoughts on happiness as viewed through the lens of music and dance. With a typhoon raging outside, the dance floor was jam-packed with a mix of Taiwanese and expats, grooving under a musical trance on All Hallows’ Eve. It was 2005 and deejay Chris Pady was slinging just the right infectious beats to rule the room. It was heady stuff, complete control, a superpower that today lies mostly dormant until he hears La Lupita and immediately he's thrown back to a time when he ruled the world. What happens when two old hippies, Charmain Coimbra and her husband, cut loose from their AARP lifestyle for a three-day California rock fest? They let nature's music rule. Writer Dorty Nowak has lived in Paris, on and off, for ten years. When friends planning a trip to the City of Lights for the first time ask her what museums they should visit, her number one choice, the Carnavalet, rarely makes the guidebook "must visit" lists. Get the inside scoop on what makes it so special. Kids and culture is a difficult thing to get right. How to introduce the kids to high culture while managing not to ruin it for the adults involved? Author Jules Older attempts to do just that when he buys tickets for the family to see Madame Butterfly at the Sydney Opera House. He'd hoped for the ultimate Believe-Me, You'll-Thank-Me-Later cultural experience. His young daughters, however, saw things differently. My husband, Gary, and I decided to visit some friends in Tortosa, a small Spanish city in southern Catalonia at the mouth of the Ebro River. I knew nothing about Tortosa, but when I searched for accommodations, I discovered there was a government-run hotel, a parador, perched on top of a promontory overlooking the river at the edge of town. The “Zuda Castle” parador began as a tenth-century Moorish citadel, was conquered by Christian soldiers, given to the Templar Knights in 1182, later became a palace, a prison, an abandoned fortress—and finally, in 1976, was converted into a luxury hotel. I pulled out my “Amigos de Paradores” membership card to make sure I got the best deal and booked us a room for two nights. Tortosa was only a few hours by train from our Girona home. The taxi ride from the train station to the parador included a drive along the Ebro River, during which we drove past an immense metal sculpture rising out of the waters. It included an eagle with wings spread, a cross, and a man with one arm raised, reaching up to a star-shaped object above his head. “What’s that?” I asked Jorge, the taxi driver. “How will you vote?” I asked. My knowledge of the Spanish Civil War is sketchy, but I know there were basically two sides: the Republicans, who won the elections in 1931, and the (fascist) Nationalists under Franco, who started a terribly bloody civil war that lasted from 1936-1939. Franco won and was dictator of Spain until he died in 1975. Judging by the monument in the river, memories in Tortosa run deep and long, and the horrors of that time have not been healed—or forgotten. We drove up a steep, winding road at the edge of town, and our driver pulled up in front of the parador. It was impressive: a huge, golden stone edifice, a stunning medieval fortification, even though most of it is in fact a modern construction. 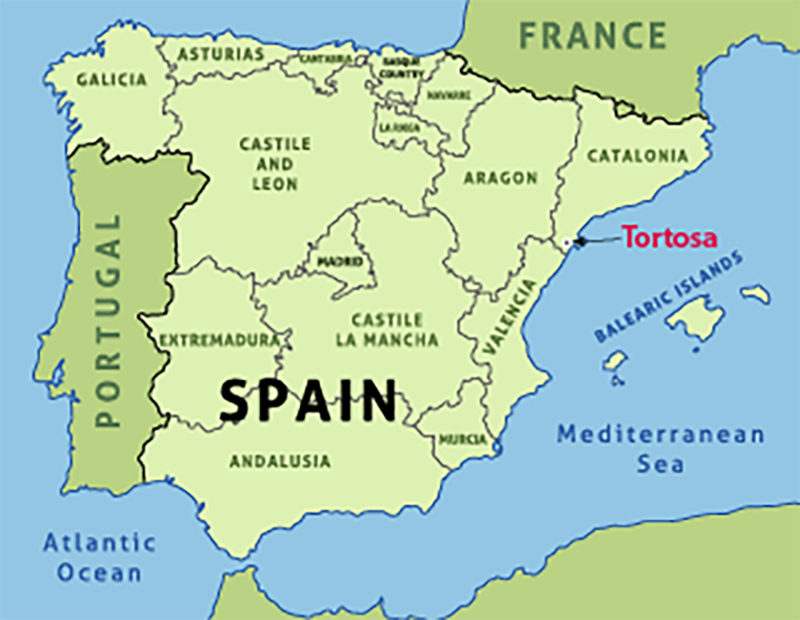 We checked in, and while Gary relaxed on the faux-antique four-poster bed, I checked online to learn more about Tortosa. According to the Caminos de Sefarad [Sefarad is the name for Spanish Jews] website, there had been a large and important Jewish community in Tortosa since Roman times. Jews, Moors, and Christians had lived in harmony in the city in the Middle Ages. Over the centuries, Jews had been in charge of international trading negotiations and had been appointed bailiffs of the city. However, this convivial situation didn’t last; all Jews (and Moors) were expelled from Spain in 1492. I woke up early, eager to explore Tortosa and learn more about its multi-cultural history. The sunrise over the hills was beautiful, casting a gentle pastel glow over the tile rooftops and stone houses that spread out below the castle like a view on Google Earth. We started our explorations at the Tourist Office. Expansive pavilions, blue and white tiles, glazed ceramic roofs, blue stucco walls, and shade trees make a delightful setting for the Tourist Office and Museum of Tortosa, opened in 2012. It was hard to imagine that these stunning buildings, inspired by Moorish architecture, had originally been built 100 years ago as the city slaughterhouse. It was located next to the river so the offal and blood could be more easily disposed of. I asked the clerk, “Do you have any information about the Jews in Tortosa?” She handed me a brochure that included a map of a walking route through the medieval judería (Jewish neighborhood) and mentioned several important medieval Tortosan Jews. I noticed a flyer describing “La Jueva de Tortosa,” a woman who sings Sephardic songs and re-enacts Jewish life in the judería. Puzzling over the clerk’s ignorance (or denial), we walked across the garden to the museum. Carlos, the museum clerk, offered to show us around. He pointed to a large graphic chart on one wall, showing the inhabitants of Tortosa: First, the Iberians, then the Romans, then the Visigoths, then the Moors, then the Christians…. “Uh—what about the Jewish population?” I asked. Upstairs there were, indeed, “a few things.” A piece of a broken pottery candlestick in a case beneath a plaque describing the two “small” minority groups (Muslim and Jew) that made up 20% of the population in the 13th and 14th centuries; a parchment copy of the 1492 Edict of Expulsion of the Jews; and a plaque describing the 1413-1414 Tortosa Dispute, in which rabbis were forced to argue with Christian missionary zealots in order to prove that Jews were wrong to deny that Christ was the Messiah. By the end of the grueling and unfair “debate,” many Jews and rabbis had converted. They could see the handwriting on the wall. The recorded disputation was used to legitimize forced conversions and persecution of Jews throughout Spain. Suddenly I wondered whether somehow the erasure of the history of the Jews in Tortosa was similar to this monument of Franco’s. We often say history is written by the victors, and that’s certainly the case in Tortosa—both by the Christians, who pretend that Jews were a trivial, incidental part of Tortosa’s history, and by the followers of Franco, who pretend the monument represents all who died. Victors not only write history, they also re-write it—and they don’t write about certain things. This silence erases events and people from memory, as if they never happened or never lived. I began to wonder: maybe it would be a mistake to remove the monument in the river. While it exists, people can’t pretend there wasn’t a civil war. Elyn Aviva is a transformational traveler, writer, and fiber artist who lives in Girona, Spain. She is co-author with her husband, Gary White, of “Powerful Places Guidebooks.” To learn more about her publications, go to www.powerfulplaces.com and www.pilgrimsprocess.com. To learn about Elyn’s fiber art, go to www.fiberalchemy.com. Gary’s blog about their expat life is www.fandangolife.com. When writer Barbara Wysocki is accidently separated from her tour group in Havana, Cuba, she's eventually reunited, but not without a few happy mishaps along the way. It took nearly 11 years and three attempts for my husband, Gary, and me to complete the 12-mile-long St Michael’s Way across the southern tip of Cornwall. That’s a rather long time for a short walk—probably a record of some sort. And even though we ended up hiking more than 12 miles, we never did manage to walk the middle five. But we persevered, although we were misled every step of the way. On weekends, Alex and Vicky, my landladies, take me on walks through Barracas and San Telmo. They have known these Buenos Aires neighborhoods all their lives; they point out old buildings they’ve inhabited and the places where grand old cafés once stood. They are sisters. They’ve each been exiled twice, the first time to Europe for political reasons, the second to Mexico for economic ones. Each time, they returned because things were improving in Argentina, and they wanted to be a part of the change. They’ve rented their spare room to dozens of foreigners over the years, English teachers and language students like me. Around the world, viewers and readers are transfixed by the racism dialogue that has transformed from a whisper to a scream in America. It took atrocities, murders, abuse to reach the point where black Americans are being heard. They are refusing to take it any more. And in my heart, I think the roots of this racism are in slavery. I thought I had a basic grasp of the subject until I went to Louisiana and discovered 12 surprising—sometimes shocking--things I learned that I wanted to share with you. I balance perilously on my teammate's shoulders, wondering what to do next. The crowd below me grows impatient. I would love nothing more than to wipe the beads of nagging sweat scurrying down my face in mini rivers, but my hands are covered in greasy grime. The cacophony of blaring music and people screaming is so loud that I can barely hear myself think. I am sweating profusely. My pores are so overrun with liquid that I fear I will float away in a river of my own perspiration. Since I am molting inside a sweat lodge, I figure I can’t go very far. Temporarily reassured. by Dorty Nowak After growing up in a family where dinner was eaten off trays in front of the TV, I wanted to create a gracious dining atmosphere in my own home. Lit candles and cloth napkins were the norm, and I combed Good Housekeeping for tips to better the ambience for my family and guests. However, it wasn’t until I moved to Paris that I discovered how little I knew about what truly makes a pleasurable dining experience. It was dark at 6 a.m. when I struggled to wake up so I could get ready to sell books. Would anyone care if I showed up or not? I was wondering what difference my books made in the world as I ate a hasty breakfast and drove to the farmer's market. Wishing I were still in my warm bed cuddling my cat, I set up my display and sat down at a table with three other authors, each of us trying to sell books to people as they passed by carrying bags of lettuce, tomatoes, and corn; they were interested in eating, not reading. Was the effort of writing a book worth it? “Tell me a little about yourself,” I said.